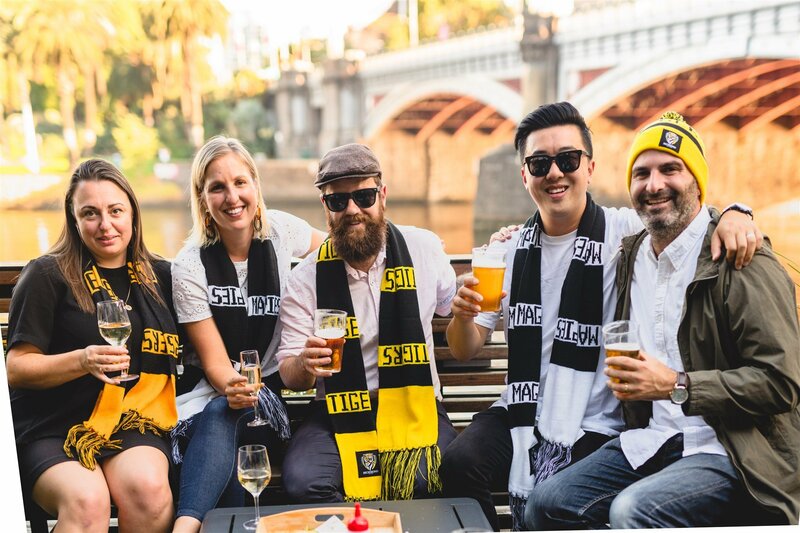 Get amongst the ultimate pre-game experience this footy season at Riverland Bar. For just $59 per person get access to the Member’s Lounge with prime riverside views, general admission footy tickets to the MCG*, two hours of unlimited drinks including a selection of tap beers and wine, and plenty of footy food. On the footy menu will be delicious crowd pleasers including mac & cheese bombs, fried chicken sliders and empanadas; as well as classic footy favourites including meat pies, dim sims, and mini hot dogs. Grab a churro-to-go with warm peanut butter and chocolate sauce for the short stroll to the ‘G. The Member’s Lounge is open for 2 hours and closes 45 minutes before each game, seating groups of 4 to 16 people. Launching in Round 4 on Friday 12 April for Collingwood v Western Bulldogs, bookings are now available for the entire footy season. Dietaries can be catered for with 24 hours notice. Drinks selection includes various tap beers, wine and soft drinks and is subject to change depending on availability. *General Admission tickets are not dated and available for any AFL game at the MCG in 2019 with the exception of Anzac Day and footy finals series. Tickets to be collected in person during the Member’s Lounge experience. One ticket available per person.